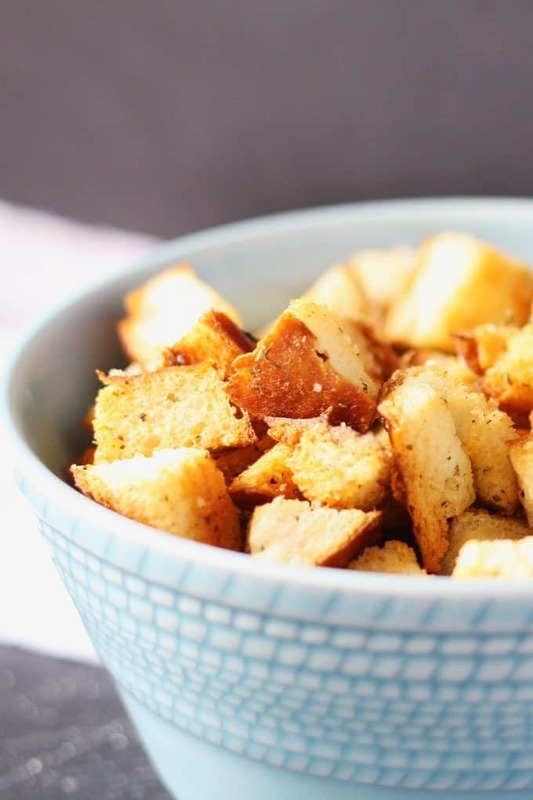 Easy homemade croutons, perfect for soups and crispy salads! Use any leftover bread but my favorite crouton bread uses pretzel buns. There is no need to buy croutons at the store anymore. Nope. Sorry crouton companies but they are so easy to make that you had best just make them yourself. I may be saying that because I’ve become the girl who makes pickles so she doesn’t have to buy them (they taste better by the way). But I’m okay with that. It’s actually become something I’m proud of. 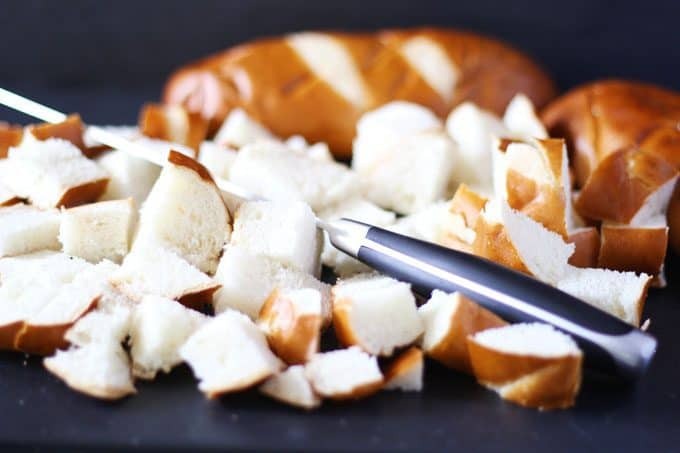 I love buying pretzel buns and breadsticks at the store and turning them into croutons. They are an easy way to add some great flavor to soups and salads. And these croutons are so good I have eaten them on their own. But enough about that – lets talk about making them. Start with leftover bread. You really can use any bread but as I said above, bread of the pretzel variety is my crouton bread of choice. French bread and challah bread are other goat options. Start by taking a serrated knife and cutting pieces that are the same size. I would say cut pieces that are about 1/2 inch squares. Toss them in a bowl with your olive oil and make sure the oil evenly coats all of the bread chunks. Then throw in your seasoning and spread them out evenly on a foil lined baking pan. Put the pan in the oven and bake. 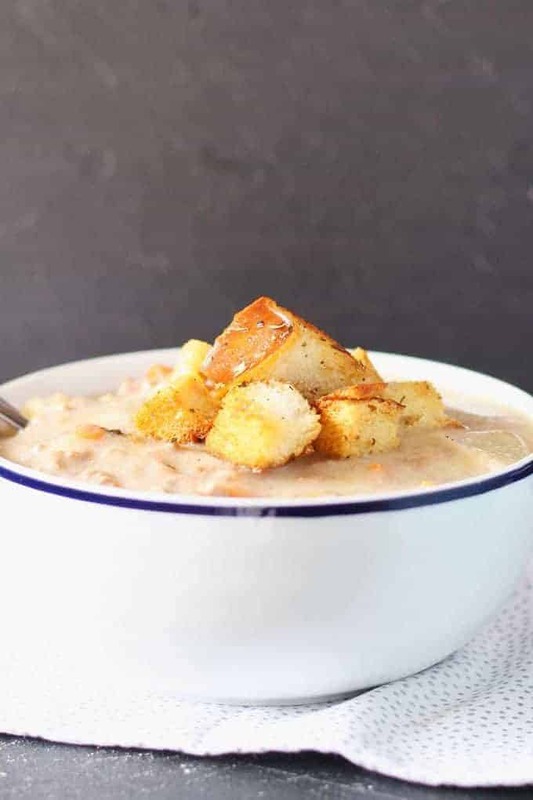 Who doesn’t want to top soup with croutons? Or a caesar said? 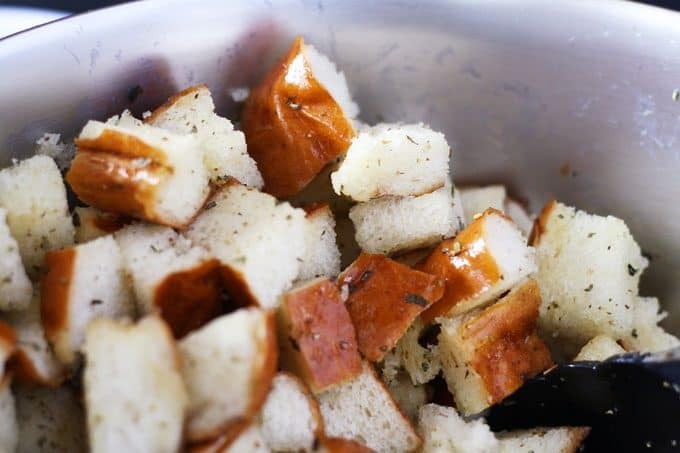 Store your croutons in an air-tight container and they should stay good for a few weeks. You’ll find yourself eating them often so I doubt they will last that long. And then you’ll have an excuse to make croutons again! Preheat oven to 300 degrees F. Line a baking sheet with foil. Put the bread in a medium bowl and toss in the olive oil. Add the Italian seasoning, garlic powder, salt and pepper and toss. Pour the bread cubes on the baking sheet evenly and bake for 20 minutes, stirring halfway through. I LOVE this! I used to make croutons all the time, but I never thought to use pretzel bread. So clever! Thanks Katie! They’re crunchy and soft at the same time – don’t know how but I imagine its because of the pretzel bread. That all sounds delicious! I will try those flavors next time I make croutons! J hope that you enjoy them as much as my family, friends and I do! Look forward to more recipes! Thank you for the qiuckie recipe,I love homemade Croutons. I love croutons! It never occurred to me that I could make my own. I bet they are so yummy when they are homemade. I have to try this. I love this! It has been a while since I have made these. Thanks for the idea. Great and better than in a box too!! I agree – there are so many things you can make yourself instead of buying at the store! looks wonderful. i will definetly try these. I’ve made croutons although it was many years ago. It was so easy and tasted so much better than bought. 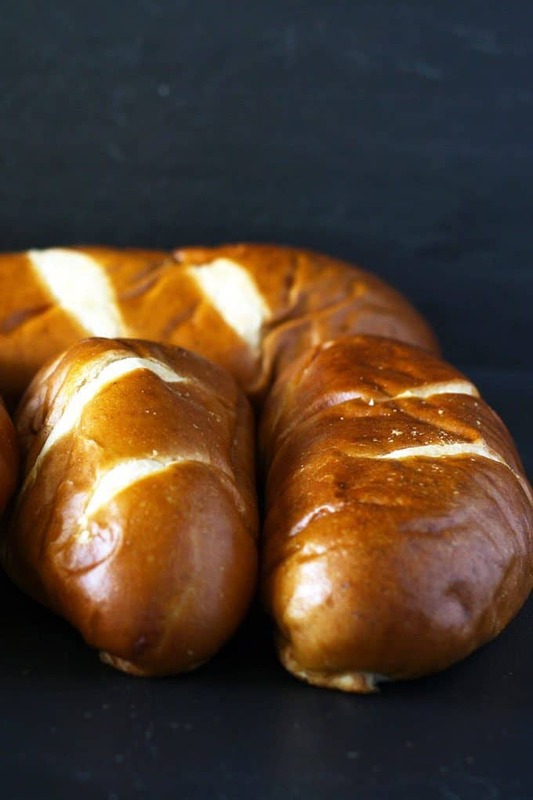 I’ve never thought of purchasing reduced bakery breads such as pretzel. Thanks for a great idea! I LOVE this! I used to make croutons all the time but seemed like they were stale before using, so now I can just make part of an easy batch. Thanks. 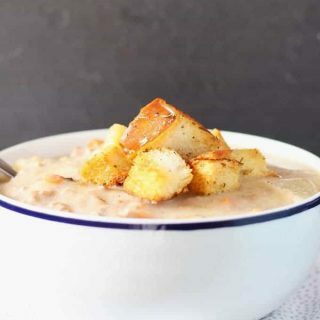 I love soup, croutons just make everything better. 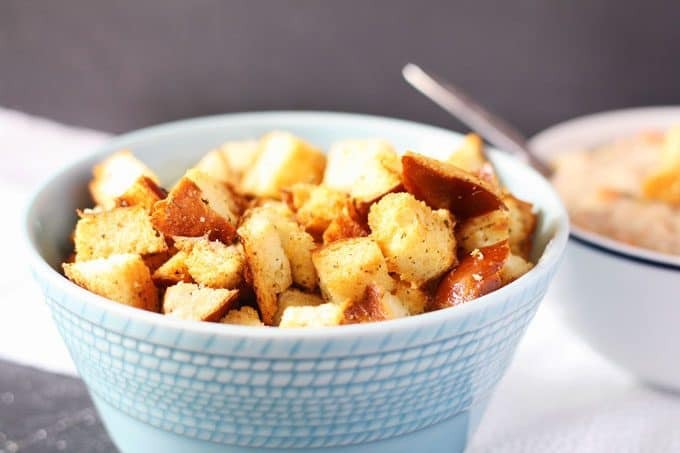 OOOH I love pretzel bread and made into croutons sounds just lovely. Thank you for sharing. Perfect! I am actually going to make my own croutons now! Thanks Jenn! They’re surprisingly easy to make! this looks delicious – bookmarking!